Material selection is one of the main and most important step involve in designing of any mechanical product. Mechanical product may consist of many components and it is very important to select the best material for each and every component of the product. Gear box designed in this project has many parts like lever, body, gears, shafts and bearings. From all these components lever and body are not the major load bearing components but gears, shafts and bearing are the load bearing components and their material will define the life and performance of the product. From these three component bearing that will be used will be pre-manufactured so only two component shaft and gear remains for which material has to be selected in this selection process. Selection of a best material for any component required the evaluation of all the available material for that component. Evaluation of the materials is usually made on number of factors which involve mechanical properties, manufacturing properties, environmental aspects and economic considerations. Each of these factors has many sub divisions and all of those factors and their sub division are explained below. Mechanical properties are the first and most important factor of material selection process as they properties will define the strength, mass and life of the components. There are almost twenty two mechanical properties related to a component but not all of them are required at a time, so from these twenty two properties few has to be selected in order to select the material with best mechanical properties. Following are some of the mechanical properties required for the selection of material that can be used in shaft and gears for the gear box. Yield strength of the material will define the limit of the stresses or the limit of the forces which can be applied on the component. This very important that material should have high value of yield strength as in gear box gears teethes will be under the bending load and shaft will be under bending and shearing load during operation. So the material of shaft and gear should have high value of yield strength on order to get safe and reliable service. Just like young modulus, shear modulus is also a material property which shows the deflection of material but under the shear stresses. These stresses will only be in shaft as it will have torque because it is main power transfer in gear box. Like the young modulus, shear modulus of the material should also not allow component to deflect to much because this can affect the operation of gear box. Density of the material is an important mechanical property as it will define the final weight of the components. Density of gear box will define its efficiency and performance because more the weight of the shafts and gears more will be the extra load on the system other the load for which the gear box is designed. So for best gear box, materials for its shafts and gears should have low density as much as possible. Machine-ability of the material is a property which will define the ease with which that material can be machined to manufacture. This property is more than just defining the machining ability of the material; it will also define the cost of the manufacturing of the product because material with good machinability will be cost effective in manufacturing than the one which has bad machinability. Environmental aspects of the material are the property which has huge impact on the material selection with the increase in awareness of environment. Environmental aspects of the material include embodied energy which is the energy used during the extraction, production, transportation and using process, CO2 foot prints which defines the amount of CO2 emitted during the life of the material and recyclability which is the ability of the material to be reused after its main life and use. Economic condition of the material which needed to be used for the component production should be good. Economic condition of material included its availability and cost in the open market. Material with the good availability but high cost will not be good choice as it will increase the cost of the product and like that material with low cost and low availability of will also not going to be the best choice so material used for the shafts and gears should have good availability and low cost. Gear and shafts in gear box will under the high stresses during the operation of gear box, So the material used for the gear and shaft should be good enough for satisfying the need of high stresses. 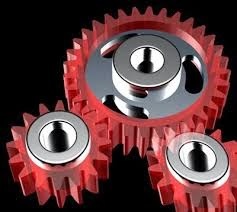 There are many materials that can be used for the manufacturing of gear and shafts but following are the three materials that can be used for the gears manufacturing. Three material that were short listed from all the other available material are been presented above. From these three material alloys steel is the best choice because it has the highest value of yield strength, elastic modulus, shears modulus and has lowest cost. Along with this it has alloy steel has high machinability and good recyclability. So alloy steel is the material for the shafts and gears for this gear box.